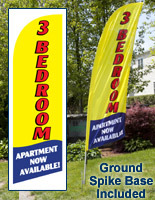 1-2 Bedroom Message Flags Will Get Your Property Noticed! Get Vacancies Filled Faster with These Banners! 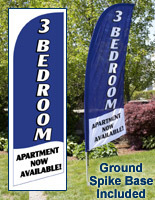 A Ground Stake is Included with These 1-2 Bedroom Message Flags! 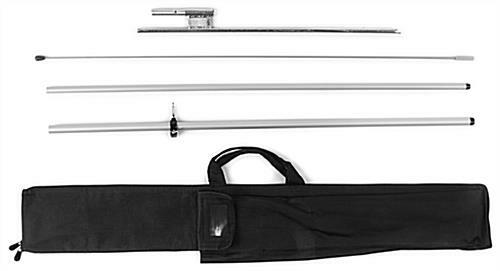 Aluminum and fiberglass pole detaches into four segments for transport. Ground spike base for showing the flag in a front lawn of a property. Knitted polyester banner is designed for outdoor use. Black nylon bag for organized transport to and from showings. 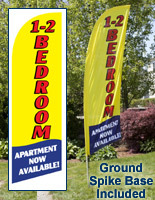 1-2 Bedroom Message Flags "1-2 BEDROOM, APARTMENT AVAILABLE NOW"
These 1-2 bedroom message flags help real estate agents fill vacant rental apartments and flats! An eye-catching design and easy to read message ensure anyone driving by this feather banner knows an apartment is available for rent. 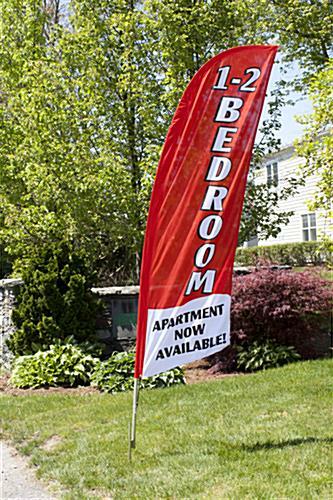 The 1-2 bedroom message flags that flutter in the wind are red with bold white lettering. Under the main text reads "APARTMENT AVAILABLE NOW!" in black font on a white background. This high contrast color scheme ensures potential renters can read the banner from a distance. 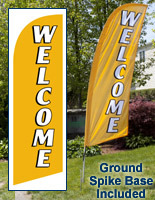 1-2 Bedroom flags that stand 8' tall are the ideal height for lining an apartment complex's entrance or positing along a road. The poly knit swooper banner is connected to the pole by a bungee cord, which gives the pennant a classic feather-like shape. 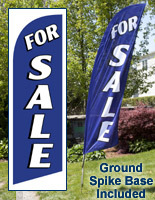 These outdoor displays are 1-2 bedroom flags that come with a ground spike base for placement anywhere there is grass. A steel construction makes the ground spike base very durable for repeated use at different vacancies. The 1-2 bedroom message flags, called outdoor displays, are specifically engineered for portability for daily use at different locations. Property managers can also take the unit inside at the end of the day to deter theft. Then set up the 1-2 bedroom message flag the following morning. Inside the black nylon carrying bag, there are separate compartments for each component. 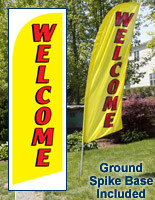 The 1-2 bedroom message flags have poles consisting of (2) aluminum and (2) fiberglass segments that connect effortlessly, and disassemble in seconds for storage and transport. The pole easily slides onto the ground spike once assembled. 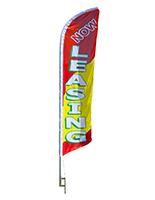 Only one person is required for assembly of these 1-2 bedroom message flags that come with an aluminum and carbon pole, making it the ideal tool for real estate agents operating individually. After the showing is finished, the banner fits inside the trunk of any car until the next showing. 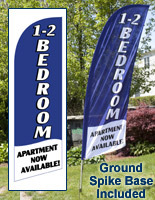 The 1-2 bedroom message flags for apartments provide agents the maximum in value. Not only is the swooper banner effective at generating inquires on a vacant apartment for rent, but the user-friendly design saves time. In addition to being durable and convenient, this one-two bed room flutter flag is surprisingly affordable and includes everything necessary for placing the unit on a property. No additional base or accessory purchases are necessary to effectively utilize this one-two bed room banner the next time an apartment is available for rent!